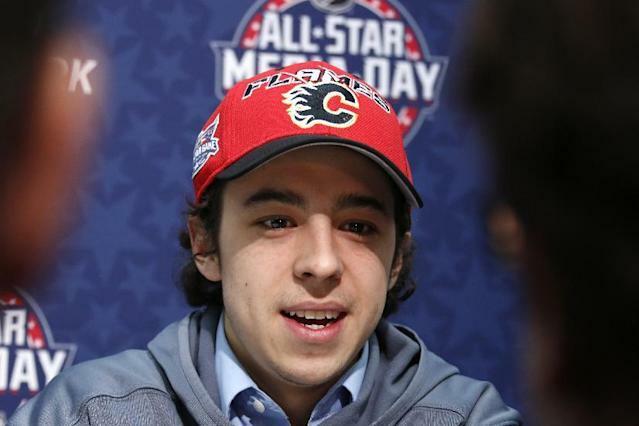 COLUMBUS, Ohio – Johnny Gaudreau is a cult hero. Johnny Gaudreau is a brand. Johnny Gaudreau is a 5-foot-9 150-pound 21-year-old kid from Salem, New Jersey just trying to make his way in the hockey world. All such descriptions fit the Flames wunderkind in his first full season in the NHL. He is loved and adored by hockey fans in Calgary and Boston College, where he played for three seasons. The Flames also have a few other portrayals of Gaudreau, who is one of the rookies here at the NHL All-Star Game, set to partake in the Saturday night skills competition. “He has a lot of different nicknames, not just ‘Johnny Hockey’ (but) we’ll keep that in the room, “ Calgary captain Mark Giordano said. It’s easy to make the comparison from Gaudreau to another famous collegiate ‘Johnny’ who became worshiped in Texas, before he turned into a dud in Cleveland. But in all honesty, all they share is a first name. While Johnny Manziel seems to constantly find himself in trouble, Gaudreau has spent All-Star weekend showing a modest nature. When asked at the NHL’s fantasy draft about his trademarking ‘Johnny Hockey’ he sort of smirked and deflected that to his agent. But what about being a super big deal in Calgary? So if you’re expecting anything crazy from Gaudreau this All-Star weekend, beyond the show he’s going to put on Saturday night, you’re going to be disappointed. But his ability to develop in a major Canadian market and perform in spite of a large crush of fans and continuing expectations bodes in his favor as do his 35 points in 46 games this season. The second half of the season is going to be a test for Gaudreau. Last season he played 40 games for BC. He has already played 46 this season for the Flames. Now as for that whole ‘Johnny Hockey’ trademark thing? It doesn’t seem to bother another young ‘Jon’ who is in Columbus. “I actually like it,” said Tampa’s Jonathan Drouin.